The 40 S&W was invented specifically for the FBI, which is the first clue on how amazing this round is. Adopted by the FBI due to its great stopping power, amazing penetration, manageable recoil, and high accuracy, the 40 S&W is one of the best self defense and range rounds on the market. 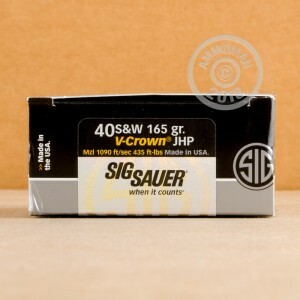 Sig Sauer is one of the most internationally renowned German manufacturers. Whenever you want first class firearms or ammunition, you can't go wrong with the precision manufacturing of Sig Sauer. These V-Crown, jacketed hollow point rounds feature 165 grain projectiles that are designed to deliver consistent penetration and controlled expansion upon impact. 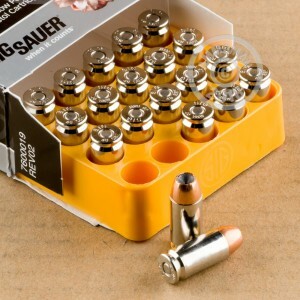 These premium self defense rounds from Sig Sauer are manufactured in Kentucky, and are perfect for your self defense needs. Don't forget, at AmmoMan.com all orders over $99 will receive Free Shipping!